My fear of heights is undeniable. Swimming skill is nearly nil. But when presented with a breath-taking landscape hundreds of feet above a vast body of water and a new adventure to unfold, I succumbed. I am glad my friends arranged a memorable itinerary for this Langkawi sojourn. Everything was pre-arranged and I was just there to enjoy and this makes me fortunate to have them as travel buddies. For a good introduction, it was a heavenly ride, gliding with a parasail on clear skies and with good friends to share the experience with. 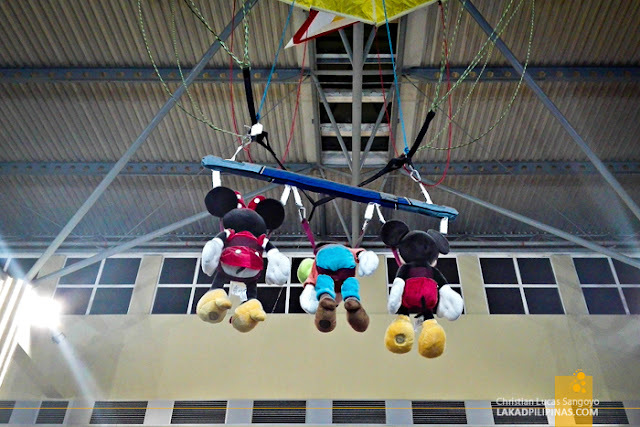 Upon arrival at the Langkawi International Airport around 7PM, noticeable is the airports’ interior which include the famous characters of Mickey, Minnie Mouse and Goofy suspended on air riding a parachute. It’s so coincidental that we’re three in the group as well. Would we look the same while on air? 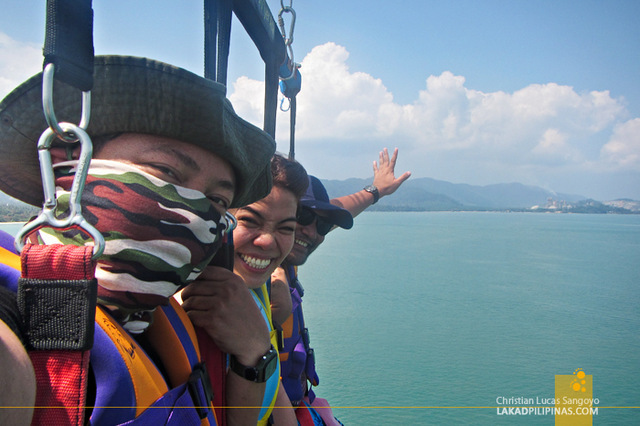 Serving as a welcome signage in Langkawi, parasailing must be a “must-do-when-in-Langkawi” thing, I told myself. I was standing at the booth of Naam Sports, a premier leisure and water sports company in Langkawi, Malaysia while waiting for my travel buddies arrival at Langkawi Airport from Kuala Lumpur, Malaysia. Morning came. After breakfast at our booked hotel, we were fetched by a shuttle van en route to Tanjung Rhu beach as our destination. Upon arrival, we were ushered to the office of Naam Sports, which is just right across the beach. And there we met a friendly Filipino staff who gave us a briefing of what to expect on this water sports activity. Since we intend to do the activity together, we were asked to weigh-in first as a safety precaution and if the parachute can hold us up in the air. Fortunately, it can. Together with other tourists, we were ushered to a speed boat which would take us to the middle of the Langkawi archipelago. It is no ordinary speedboat to begin with. 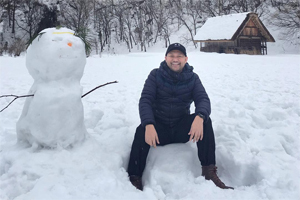 The marketing director was on board as well, enough reason for us to know how dependable and safe this activity will be. We were boarded on a Sea Osprey, a state of the art parasailing vessel. Naam Sports is the only certified and fully insured provider of parasailing adventures in Langkawi. The parasails are also custom-made with a variety of safety features to ensure a smooth sail even on turbulent wind. Safety is the main focus of the company, thus, the crew are all well-trained, life vests and harnesses come in various sizes to fit different types of physique and more importantly the passenger bar is adjusted according to one’s weight. With that credentials, my fear of heights lessened and I am more than excited to be floating 500 feet above the Langkawi archipelago. We were the last ones to do the parasail. The parasail can carry up to a maximum of three and I’m glad it can. I need support for this ordeal. When our time came and respective harness were attached, I had mixed feelings. There’s no backing out after all. In no time, after the screaming and ranting, we were suspended in air. 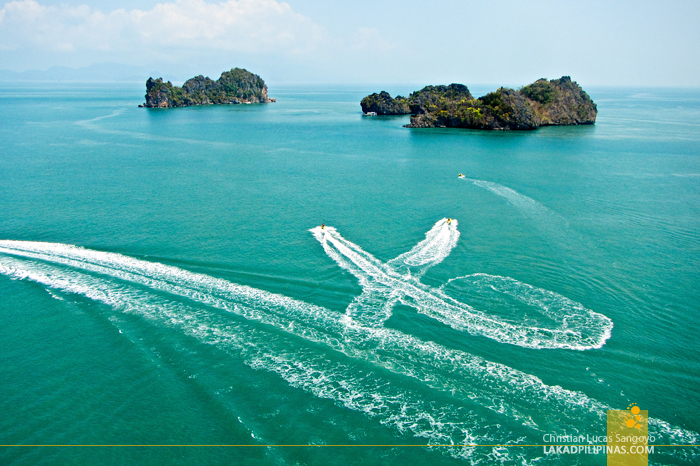 The limestone cliffs at Tanjung Rhu was a sight to behold and the Langkawi archipelago in general on a bird’s eye view. It was good that one of my travel buddies was able to bring his underwater camera and that he was able to document the scenery and the experience up in the air. As for me, I continuously grip the straps while on suspended air as I glance at the scenery down under. It was 10-minute ride up in the air. We were asked beforehand if we want to deep in the water before landing on the Sea Osprey and of course we agreed. The 10-minute was short for my travel buddies while it was so long for me. But, I would be more than willing to experience the same all over again.